Before starting the vehicle, driver places all personal mobile devices inside padded interior of Phone Blox. While ignition is on, Phone Blox remains locked. 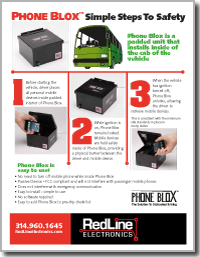 Mobile devices are held safely inside of Phone Blox, providing a physical barrier between the driver and mobile device. When the vehicle has ignition turned off, Phone Blox unlocks, allowing the driver to retrieve mobile devices. This is consistent with the minimum idle standards in place in many states.